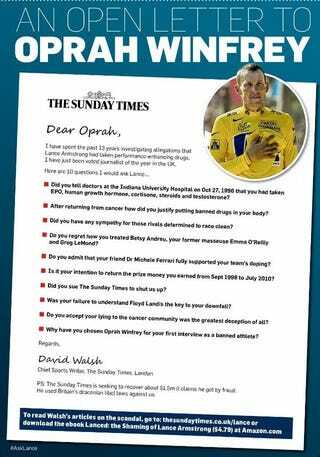 David Walsh, sports editor of The Sunday Times, took out this advertisement [click to enlarge] in The Chicago Tribune telling Oprah Winfrey what to ask during her interview with Lance Armstrong tomorrow, because Oprah and her staff only read their hometown paper and there is no other way to reach them. In the long and depressing history of people leveraging steroids scandals for career advancement—concern-trolling for fun and profit—this is, we think, a new touch: an expensive ad, which makes sure to note it was written by someone who was "just voted journalist of the year in the UK" and prominently features the logo of the paper that sponsored it and plugs for the paper's website and the editor's e-book, trying to hijack an interview. One could argue that the Times has a vested interest in the interview's outcome—Armstrong sued the paper for libel in 2004—but that would probably be overstating the importance of what gets said on Oprah's couch. Are these even good questions? The answer to the second would surely be "I wanted to win." Most of them are leading or deliberately accusatory. Some may be the right questions, in a certain sense, but Oprah won't ask any on the list that she hadn't already thought of, and that makes this series of requests nothing more than grandstanding. Oh, look, there's even a little hashtag on the bottom, so we can get this trending. Go away.